Not only is this a super quick and satisfying meal for a busy weeknight, it also only requires a single pot so less clean up! Yay! Okay, okay, so I realize that this is another Asian-themed meal in the same week. The other recipe I have to post is… well… a chicken & noodle stir-fry sooo… apparently… I was craving Asian flavors this week. But they are good for quick meals and they are tasty so I don’t really apologize for it. Not too much, anyway. The nice thing about making noodle bowls at home, though, is I have more control over it so it’s more a bowl of noodles and oodles of good stuff than oopy, goopy soup. And since he had been not-so-subtly hinting that he was craving a non-Italian pasta dish, I figured it was time for me to come up with one at home. My brain almost instantly went to my hoisin sauce recipe because, well, it’s awesome and easy to make. And, rather than cooking noodles to add to a sauce, I figured it’d be tastier to cook the noodles *in* the sauce. We do it with rice and couscous all the time so why not pasta? Now, if you look at my pics, you will see that I made a mistake when cooking the strips of steak: I did not have my pan hot enough. That left the meat greyish instead of brown but it still tasted good. The dish is just less photogenic. It happens! 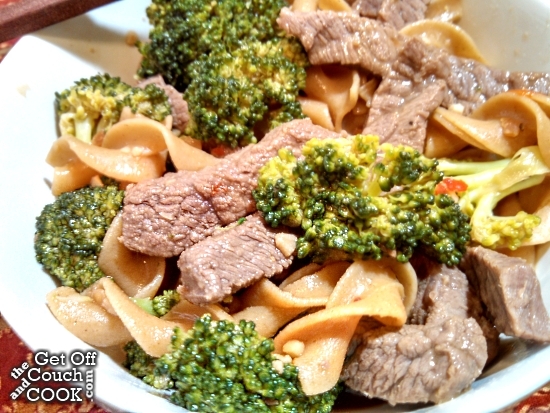 So to make this, all you do is cook the meat, remove it from the pot, add the sauce, bring it to a boil, add the pasta, add the broccoli, add the meat then make yummy sounds while slurping down. If you want to save a little time but dirty 2 pans, you could also bring the sauce to a boil in the pot while cooking the steak strips. That’d save about 5-10 minutes. 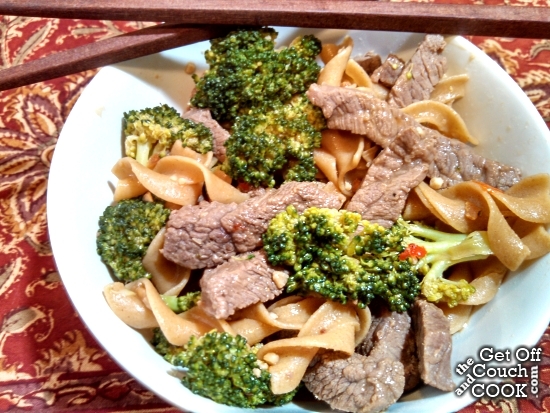 To serve it, just ladle the noodles, broccoli, and beef into a bowl then ladle the sauce over it. Even though the sauce is really tasty, I put very little in my bowl whereas Mr. O’s bowl looked like a bowl of soup so you can make it work in whichever way works best for you! What are some of you favorite quick dinners that don’t involve prepackaged foods? 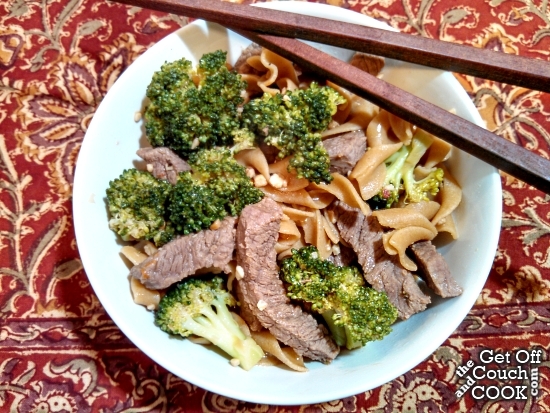 In a medium bowl, whisk together the broth, soy sauce, peanut butter, honey, garlic, vinegar, sesame oil, and sweet chile sauce. Set aside. In a Dutch oven or medium stock pot, heat the canola oil over medium-high heat until shimmering. Season the beef strips with salt and pepper then add to the oil. Cook, stirring constantly, until the beef is starting to brown but is not cooked through the center, about 5 minutes. Remove the meat to a bowl and set aside. Turn the heat up to high and add the sauce to the pot; bring to a boil, about 5 minutes. Add the noodle and stir. Bring back to a boil and boil for 4 minutes. Stir in the broccoli and bring back to a boil again. Boil for 2-3 minutes. Add the steak and bring to a boil for the last time. Boil until the pasta and broccoli is tender. 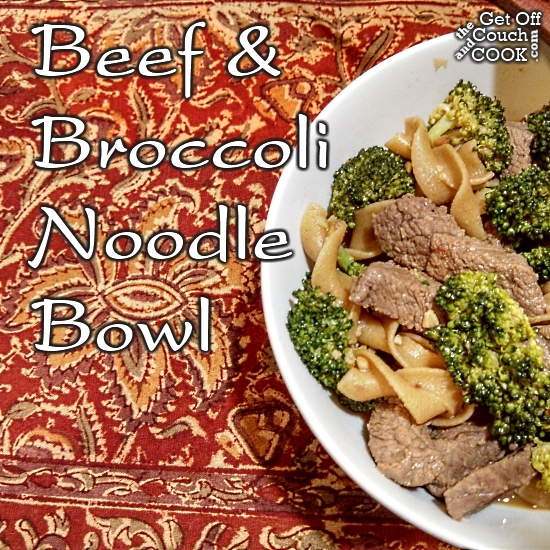 Spoon the noodles, broccoli and beef into bowls. Ladle as much or as little sauce over the noodles and meat. 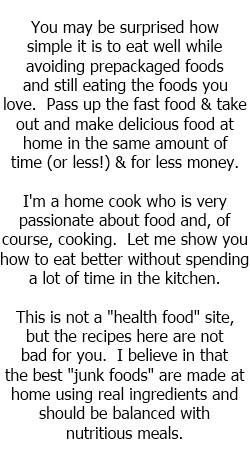 Do not click on “Read more” unless you REALLY want to know why I can’t eat soup based on how it looks. It’s a gross reason so I want to make sure you are prepared.